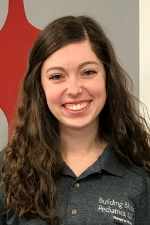 Lauren is a certified Speech-Language Pathologist who earned both her Bachelor’s and Master’s degree in Speech Language Pathology at Ball State University. She is certified nationally through the American Speech Language Association (ASHA) as well as holding her Georgia State License. Lauren recently co-authored a children’s book with a target audience of children with language delays. Through this opportunity, she researched tools for language development, as well as created resources to help parents encourage language development in a natural environment. Lauren is certified in Interactive Metronome. Lauren has experience working with children, 2-21 years old, in the following areas: Articulation and Phonology, Fluency (Stuttering), Early Childhood Language Delays, Expressive and Receptive Language Delays and Disorders, Autism, Feeding, Pragmatic Language (Social Skills) and Down Syndrome. She is very passionate about helping children achieve their highest potential! When she is not working, Lauren enjoys being outdoors, traveling, and spending time with her husband, friends, and family.